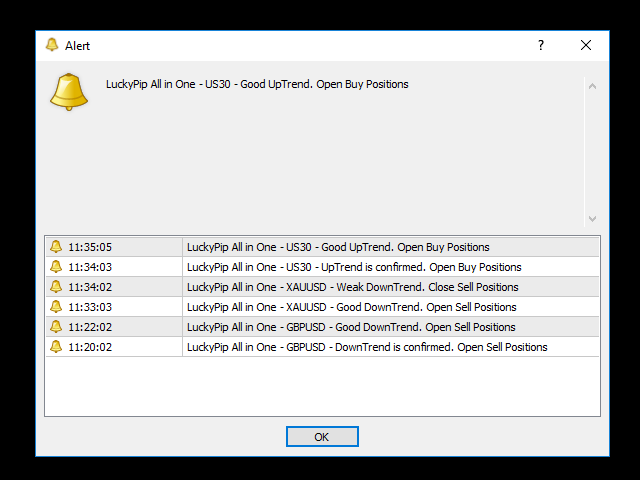 LuckyPip All in One indicator is a good solution for easy and fast analysis of a pair. It summarizes everything in only one window. Indicator has 5 different analysis sections. These are Price, High & Low, Trend, Hourly Volatility and Positions. Daily and Monthly High-Low prices are updated in every new price. 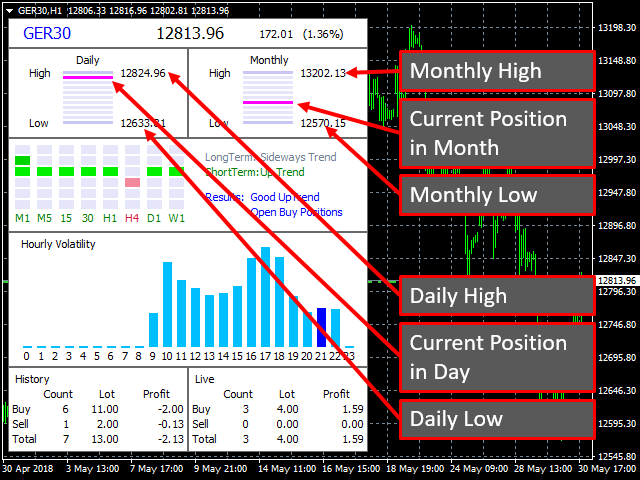 There are two lines indicating where the price is currently in daily range and in monthly range. 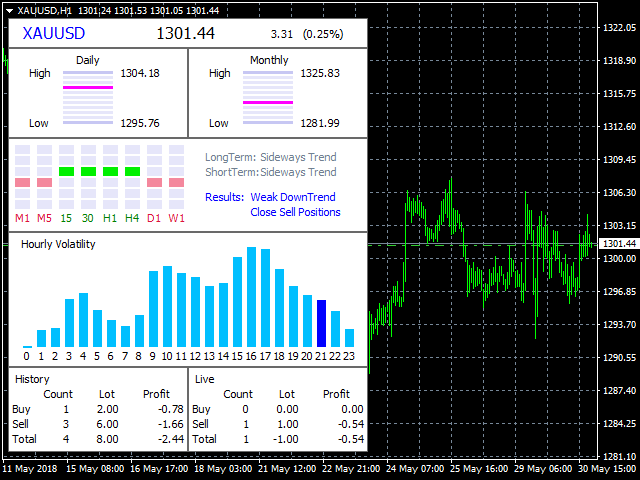 It has smart algorithm that detects the trend in all timeframes. Then it gives a trend result as summary of LongTerm and ShortTerm Trends. 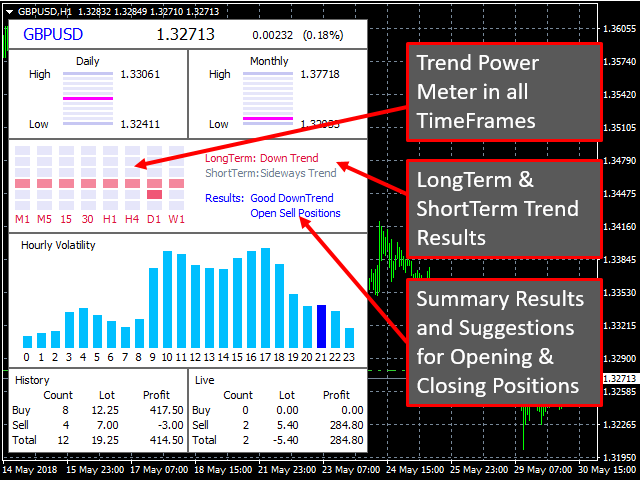 It also provides open and close signals by calculating all timeframes trend. Alert system is running when the trend has changed. 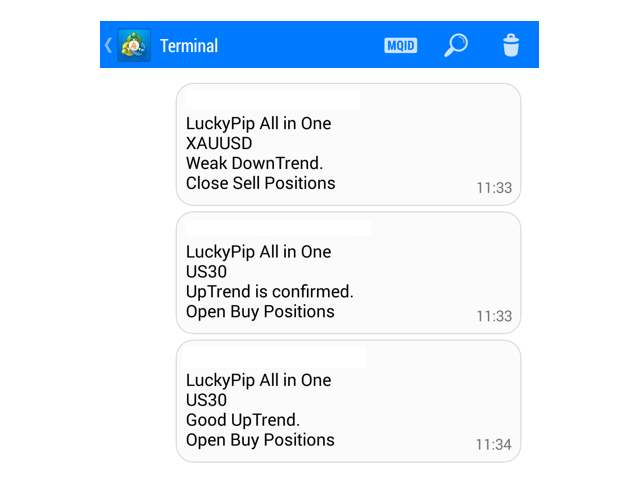 If the trend reached to end of phase, indicator will send immediately notification or message to you for good exit point. 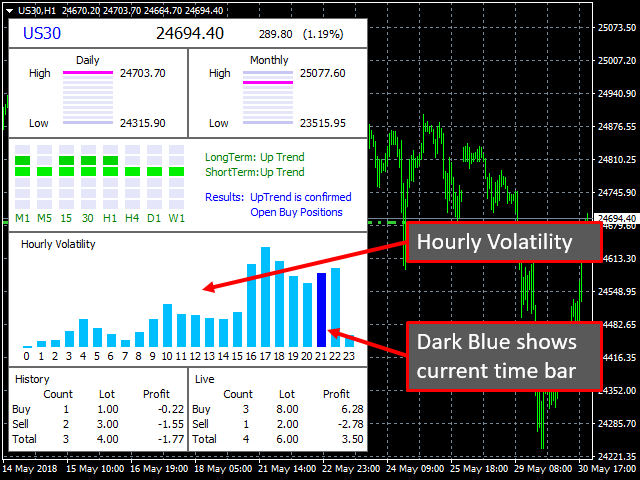 Volatility is the most important indicator for intraday traders. You may find out what hours are good for your trading. There are two windows. One is for history positions, the other is for live positions. Positions are calculated as buy, sell and total. 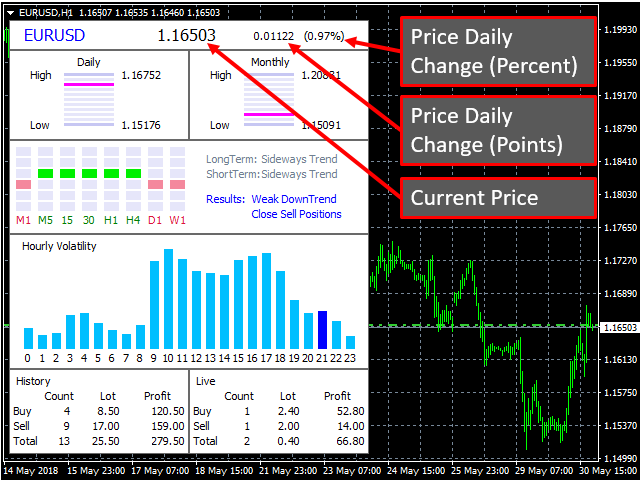 3 different methods are used for positions: Count, Lot and Profit. Open and Close Signals are provided by indicator. Trends on all timeframes are calculated every minute. Push notification and Display Box alert is added. No dependence from the chart timeframe. It shows same results in any timeframe. You may use this indicator for all instruments. 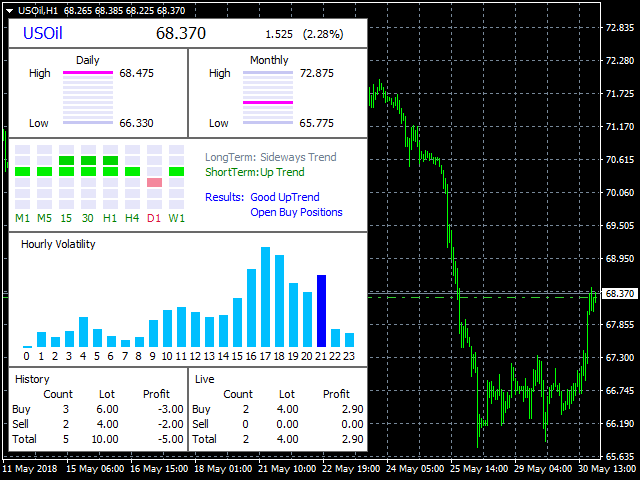 It is a supporting tool for trading systems as Trend filter. Push Notification Alert: When it is true, it will send notifications to your phone. Display Box Alert: When it is true, it will send message to your computer screen. I am developing automatic trading strategies and indicators for 9 years. Especially I am working on major currencies, CFD and Futures. A product of this sort always interest me, as they can be very profitable if used properly. Problem with the system is at heart currently, which i am sure karas is working towards. Pro: 1. Very user friendly, as it is plug and play. 2. The user interface is very soothing to the eye. 3. Push notifications are available. 4. Uses very less CPU so can be used on multiple charts. Cons: 1. Lack of settings availble in input. And due to this yoy cannot filter a true signals. 2. 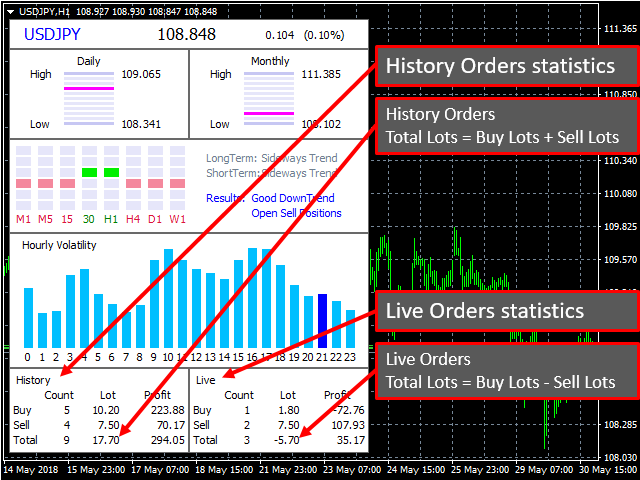 Signals frequency changes every 2 or 3 minutes, so you do not know what to trade, system in current state in unstable to use. From strong sell to weak signals it can sometime be only 2 mintues and then reverts back to strong signals and keeps doing the same. For now 3 stars until anything changes. - New dashboard settings are added. They are listed below.